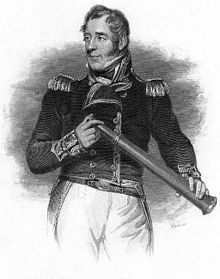 Admiral Thomas Cochrane, 10t Yerl o Dundonal, Marquess o Maranhão, GCB, ODM (14 December 1775 – 31 October 1860), styled Laird Cochrane atween 1778 an 1831, wis a Breetish naval banner officer o the Ryal Navy, mercenary an radical politeecian. He wis a darin an successfu caiptain o the Napoleonic Wars, leadin Napoleon tae nickname him Le Loup des Mers ('The Sea Wouf'). He wis successfu in virtually aw his naval actions. ↑ "Lorde Cochrane, o turbulento Marquês do Maranhão" (PDF). Revista Navigator. Retrieved 9 February 2018. ↑ The heir-apparent tae an yerldom uises the Yerl's next-heichest teetle as a coortesy teetle. ↑ Even efter he haed inheritit the teetle o Yerl o Dundonal in 1831, he wis eften still referred tae as Laird Cochrane. This page wis last eeditit on 14 Mey 2018, at 07:08.